← What Makes an Alien Intelligent? SpaceX Successfully Soft-Lands on Earth for First Time. Is Mars Next? The other day, I noted that there wasn’t much information on what had happened with the SpaceX soft landing. Now there is a bit more, and it sounds promising. In addition to maybe saving 70% of launch costs, the technology could have benefits for future Mars landings. After flying to the edge of space, a spent SpaceX Falcon 9 rocket booster successfully returned to Earth, deployed its landing legs, and hovered for a moment. The ability, known as a soft landing, could allow the company to dramatically reduce the cost of spaceflight and one day land rockets on Mars. Because it came down at a spot in the Atlantic Ocean, SpaceX’s rocket had nothing solid to land on. It crashed into the ocean and was lost to large waves from a storm before the company could get a boat out to recover it. But in the next few months, SpaceX hopes to reproduce the achievement. “We expect to get more and more precise with each landing. If all goes well, I am optimistic that we can land a stage back at Cape Canaveral at the end of the year,” said entrepreneur and SpaceX founder Elon Musk, during a press conference Apr. 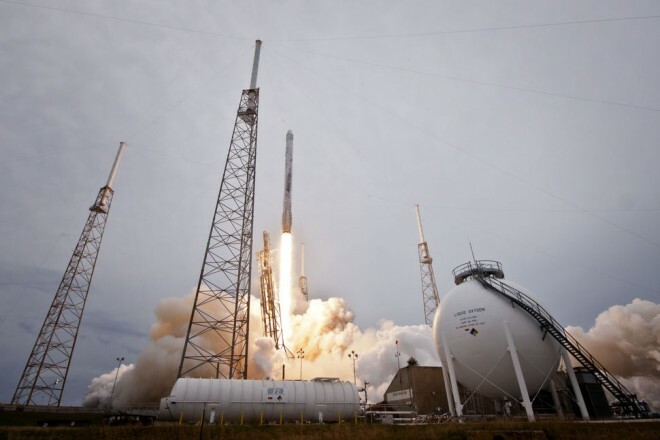 25 in Washington D.C.
via SpaceX Successfully Soft-Lands on Earth for First Time. Is Mars Next? | Science | WIRED. This entry was posted in Zeitgeist and tagged Atlantic Ocean, Cape Canaveral, Elon Musk, Falcon 9, International Space Station, Mars, Soft landing (rocketry), Space, SpaceX. Bookmark the permalink. 2 Responses to SpaceX Successfully Soft-Lands on Earth for First Time. Is Mars Next?